Some wonderfully elegant and understated jewellery can be made from this kit. 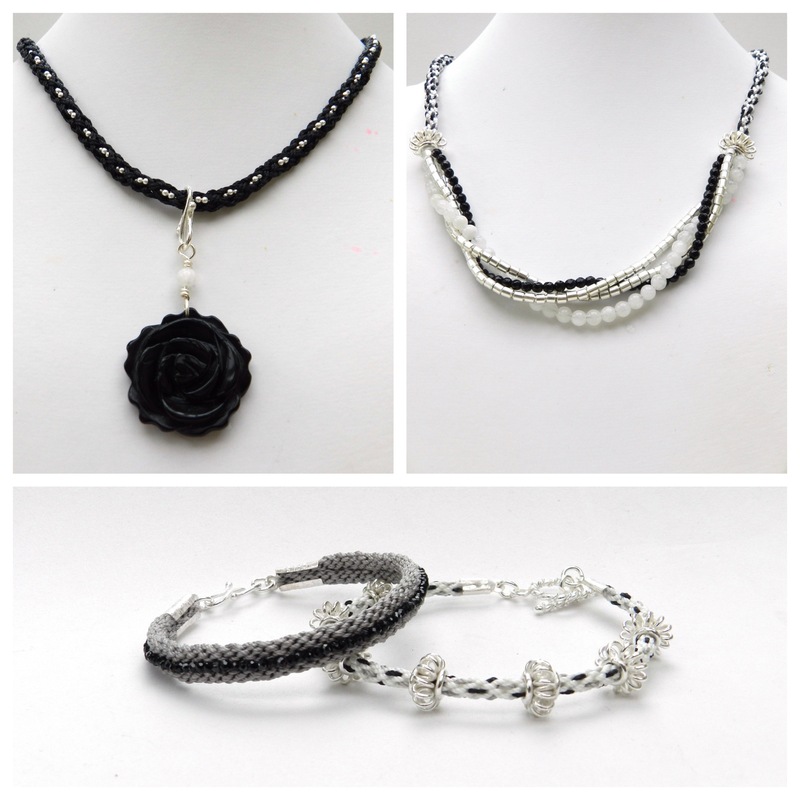 It included a carved agate flower pendant, black spinel faceted seed beads, ball chain, a selection of 3mm and 4mm rounds, silver tube beads, wide hole spacers and S-Lon in 2 different sizes, but these designs can be made by substituting other materials. The show can be seen by clicking here. The braid used for this design was demonstrated on the show. 1. Cut 1m x 8 cord and braid for 1cm using the Hollow Braid instructions. 2. Lay the ball chain diagonally across the disk between the pairs of cords. Pass the end of the chain through the hole and clip it to the knot using the weight. 3. Complete one full set of braid instructions (both clockwise and anti-clockwise). Flip the ball chain from one side of the disk to the other. Carry out another full set of braid instructions and flip the chain back. Continue to flip back and forwards in between sections of braid. As you work keep an eye on how evenly the chain is positioned on each side of the braid. This type of necklace is made by threading a selection of beads and spacers onto 4 cords, measuring 1.2m. Centre the beads and tie them together at both ends of the beads. Thread on a wide hole spacer and tie on 2 more cords, folded in half to give 8 cords for the kumihimo sides. More cords or wider cords can be added at the sides if a wider braid is required. The black spinel is threaded onto beading cord (I was in a rush, so I kept it on the original cord, but that can be risky!). Sew two braids together and then sew the spinel into the groove between the two braids. Hide the end of the beading cord in a fold over end. This type of bracelet looks easy, but it can be tricky! The aim is to get the braid to exactly the right size to fit the beads snugly. The braid can be stretched to make it slightly thinner and then the beads will slide on easily. As the braid relaxes back into shape it should grip the beads. Individual tension, materials, condition of disk and even the mood of the braider will affect the size of the braid. This is how I made the braid, but it may not be exactly right for everyone.